Latterbarrow is a very popular little fell close to Hawkshead, in fact if you stand at the entrance to the car park and look north east you can just about see the tall beacon that sits on its summit. Even on a cold but bright March weekday there was a steady stream of people on the fell and wandering the forestry plantations of Claife Heights behind it. The walk starts at the only car park in Hawkshead, and takes to the roadside for a short distance. You are quickly off what might be described as the main road, onto a minor country lane that zigzags through the hamlet of Colthouse. A little further along the road it is left to climb steadily through a rough field and to the access land. Despite being a short little fell the path gets quite steep and climbs stone pitched steps. Don't forget to look behind you as the view has opened out considerably. The summit area of Latterbarrow is a bumpy plateau crowned by a tall beacon. It's said to be a memorial but there is no plaque, and no-one can remember to whom, or any other reason why it's there. The return is made by descending away from Hawkshead to wander a clear path through the plantations to a track. Once on the track it's quite an easy walk to gradually swing back to the village. 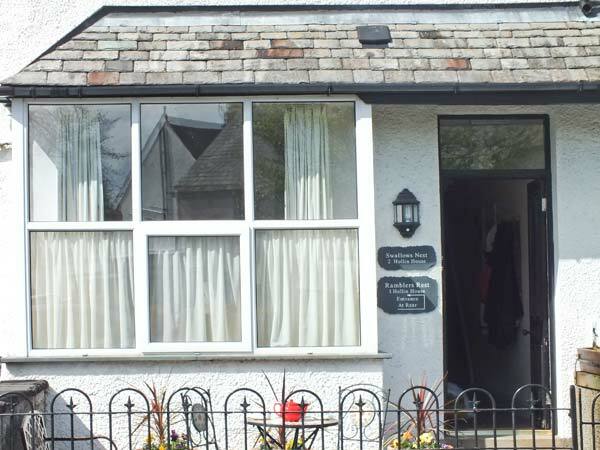 Hawkshead is well known for its associations with Beatrix Potter, otherwise known as Mrs Heelis to locals and breeders of Herdwick sheep. Less well known perhaps, is that a certain Mr William Wordsworth studied at the village grammar school which prepared him for going on to St John's College, Cambridge. There is a Lake District National Park Authority pay and display car park on the southern edge of Hawkshead. This walk takes you to the top of the following hills: Latterbarrow; and includes 1 Wainwright Outlying Fell. Rough paths, steep stone pitched steps, and forestry tracks. Keep an eye on the map, instructions, and your position as you can easily lose where you are amongst the forestry paths and tracks. Return to the car park entrance and turn right, then right again. At the 'T' junction turn left signed to Sawrey and Windermere. Cross the bridge, with the pedestrian bypass on the right, and in 100m (110 yards) bear left signed to Wray. Wiggle through the 'S' bend at Colthouse, climbing gently. As the road, and view, opens out on the left hand side the view is to the Coniston Fells. Just past a turning on the left, turn right through the gate, signposted public footpath, and onto Latterbarrow. There is a National Trust sign here. Follow the track up the fellside, it gradually fades into a path. The path splits at a short post with yellow footpath arrows, bear left to cross a beck, and then bear right to climb the path climbing steeply up the fellside. Continue up the stone pitched staircase, and pause to look behind you for the view over Hawkshead. As you get higher you may just recognise the Crinkle Crags and the Langdale Pikes appearing. The tall beacon on Latterbarrow comes into view as the gradient eases. Instead of bearing right towards it, take a sweeping arc over to the left as the line of outcrops gives an excellent view down to Windermere, Ambleside, and the Fairfield Horseshoe. Make sure you swing right to the beacon. From the beacon, bear right onto a wide path descending southwards, Hawkshead can be seen below to your right. At the bottom of the slope, turn left over the step stile, and follow the path bearing left again. This swings right to go through a gap in a wall, and then forks. The right branch makes a more direct line for the bridleway back to Hawkshead, but we turn left to follow a clear wide path. It swings to the right, then left, and then drops though trees to a forestry road. At the forestry road turn right, soon reaching a fork take the right branch. Keep on the track as it climbs a little to a 4-way signpost (marked as guide posts on the OS 25K map). At the signpost turn right onto the bridleway signposted to Hawkshead. It's now a clear track all the way back to the minor road just above Colthouse. Look out for the very old stands of juniper next to the track just as you pass a shallow boggy tarn on the left. Reaching the road turn sharp left, and return back into Hawkshead.